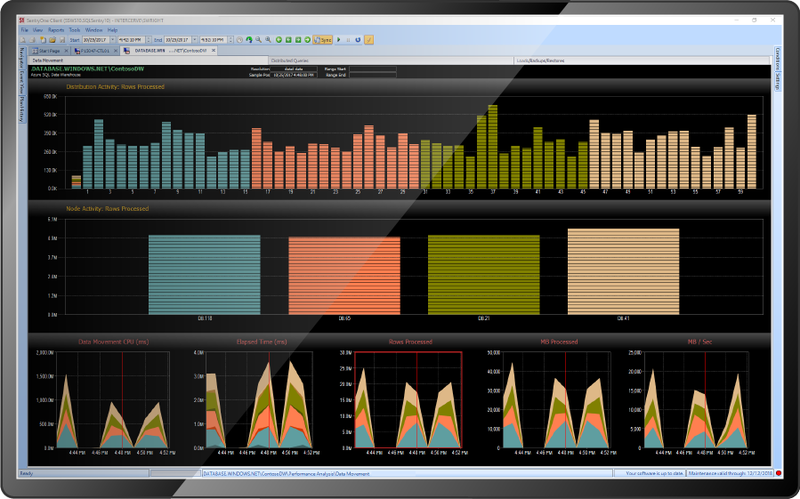 DW Sentry accelerates Azure SQL Data Warehouse performance. DW Sentry gives you detailed visibility into the queries, loads, backups, and restores of all your data. With the event calendar and intelligent movement dashboard, you always know what factors are impacting workload. If you're not monitoring Azure SQL Data Warehouse across your Microsoft data platform, then you're not seeing the whole data performance picture. DW Sentry helps you get more value from your cloud-based data warehouse investment. Identify data movement activity quickly and easily. Zoom in to pinpoint periods of activity, navigate to a relevant time period, and easily toggle between other SentryOne diagnostic and optimization tools. View information about both in-process and historical events through the Loads, Backups, and Restores grid. Is DW Sentry for You? If you are running Azure SQL Data Warehouse, then you need DW Sentry. With DW Sentry, you will accelerate your return on investment by increasing your data platform speed and efficiency. Ensuring optimal performance of your Azure SQL Data Warehouses means you can deliver accurate, business-critical information to your end users. DW Sentry gives your data team logically presented, actionable metrics to view the entire data warehouse environment so they can quickly identify bottlenecks that might cause delays. As part of the SentryOne platform, DW Sentry comes with the industry’s lowest overhead, so as you grow you will increase efficiency by minimizing additional overhead and costs. Don’t get caught blindsided by performance issues across your data warehouse: Get DW Sentry to accelerate delivery of your business-critical data. *Subscription pricing is based on a 12-month term paid in advance with automatic renewal at the end of term. How many data warehouses to quote?